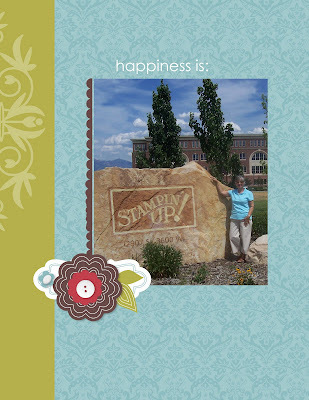 Go to my stampin UP! 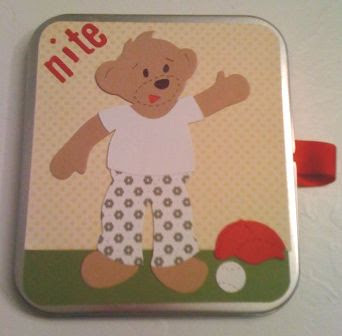 website to order and you will find a clearance rack of items that are 80% off original price, they are retired items. Take a look and you may find something you loved before and have an opportunity to purchase. Thanks for looking! Go to shop now and then look on the left hand side and click on Clearance Rack to view. This has become an annual event across the world when friends and stampers gather to make cards. You will be making Christmas cards/projects (3 total) for $20 Join me and have an afternoon of fun and get those creative juices flowing for your holiday cards and decorations. RSVP by Thursday Oct 1st by email or phone. First FIVE people that order the My Digital Studio from me from today through the weekend Oct 4th, will get one of the single stamps on page 208 free from me. Don't forget you can have this great new product for 1/2 price from Oct 1- Nov 30th by having a $400 party as well as anything in the Holiday Mini Catalog (except for My Digital Studio and hostess sets) for only $10. Contact me today to secure a date on my calendar. 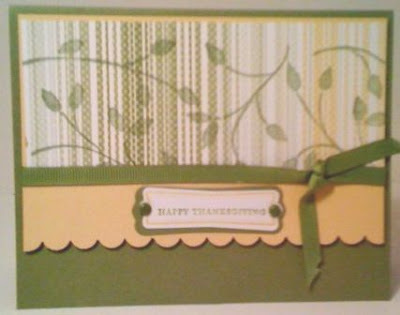 This weekend I have been working on fall cards and I keep going back to old olive so I decided to make that my color of the week and I will have more samples this week so stay tuned. I finally decided to stamp with bleach recently and I love the way it turned out. I stamped on old olive cardstock with bleach and it turned the stamped image a color close to so saffron. So I made that my coordinating color. You may want to try other colors to see what the bleach does to it. This is very easy to do, I folded a paper towel on a plate and poured household bleach one the paper towel and touched my stamp to it as if it were an ink pad and stamped on cardstock and voila you have a neat new color. Let me know what you come up with. If you live in the Raleigh/Garner area please join us to make cards for the troops. I am liking the MDS so much, it is so quick and easy, the samples I have been working with are simple but nice and you will want to purchase the software starting on October 1st. Remember you can get it for 1/2 price with a $400 workshop/party. Contact me to get your workshop on my calendar. I will be posting more over the weekend. I have been playing with My Digital Studio again and came up with a very simple page using only Brocade Blue and Whisper White. I did not use a template on this one, I wanted to see what I could do. 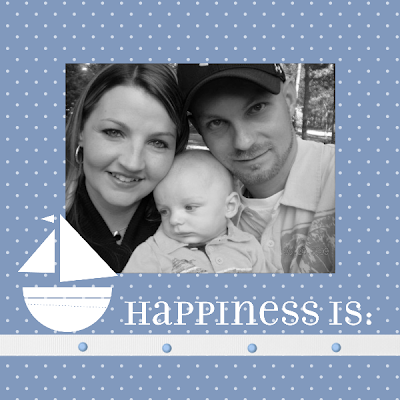 I love the simplistic look to it and using a black and white photo of my downline and friend Jessica and her family. I can't wait to work on more projects this weekend. Remember October 1st you can get My Digital Studio for 1/2 price $49.95 with a $400 workshop. You can not get it with an on line order. Call or email me today to get your party on my calendar. WOW, is all I can say, I got My Digital Studio software yesterday and have made several things already. I wanted to share with you one page from my convention scrapbook that I am working on. MDS it sooooooooooo easy to work with. I love the way it came out. 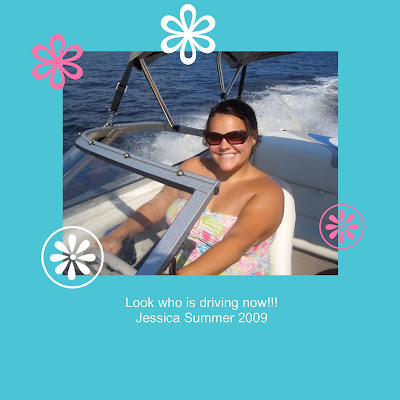 On the page below I used one of the templates they have in the package and just popped in (actually click and dragged) my picture and took off a circular word stamp. How easy does it get. You are going to love it when you see it. 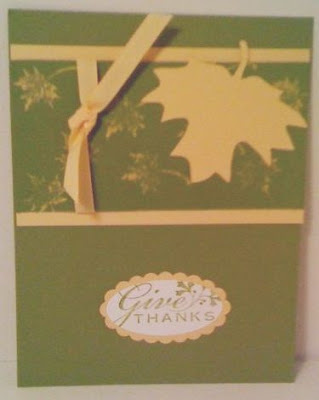 I will share some of my projects at my Stamping Bunco party next Tuesday night. p.s. you can order the My Digital Studio October 1st. You will want to book a party with me and earn it for half price in October.